Visiting Queens and looking for a place to swim? Nice choice! Don't forget to tell us how did it go. 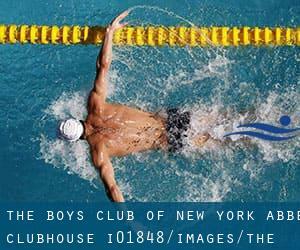 Introducing now The Boy's Club of New York - Abbe Clubhouse swimming pool, a great swimming pool sent by a swimmer like you few days ago. Have you visit this pool? Do you work here? Please, contact us should you have facts which you believe is gonna be useful and keep in mind from now on you could now promote each pool just by sharing this page with your friends or adding comments in the Facebook boxes below. Come on and support this pool to be the first in Queens! Among all of the activities offered by the center, for anyone who is keen on swimming you can expect to appreciate 20 yards, 4 lanes, Indoors. Just in case you want to make contact with this Swimming Pool prior to dropping by, we only know the phone number. 6709 108th St. , Forest Hills , Queens , NY , USA (Postal Code: 11375). This sports center provides 20 yards, 4 lanes, Indoors. For this Pool, only phone number is number here. 177 Baisley Blvd. , Jamaica , Queens , NY , USA (Postal Code: 11434). Among all the activities offered by the center, when you are interested in swimming you'll get pleasure from 25 yards x 30 feet, 9 feet depth, Indoors. Just in case you wish to make contact with this Pool before dropping by, we only know the phone number. 138-46 Northern Blvd. , Flushing , Queens , NY , USA (Postal Code: 11354). Few days ago a regular user of this center told us they offer 25 yards x 45 feet, 6 lanes, Indoors. Furthermore, they keep in good conditions 20 yards, 3 lanes, Indoors. For this Swimming Pool, only phone number is number here. ""Building E"" , Thomson Avenue at Van Dam Street , Long Island City , Queens , NY , USA (Postal Code: 11101). Swimmers like you reported 25 yards, 6 lanes, Indoors. Unfortunately we do not have the e-mail address of this Swimming Pool, but we can provide you with the phone number. 238-10 Hillside Ave. , Bellerose , Queens , NY , USA (Postal Code: 11426). Swimmers like you have reported 25 yards, 4 lanes, Indoors. Also, you will find 25 yards, 6 lanes, Indoors. If you must contact this Swimming Pool, email address and phone number are both number. 2112 30th Road , Long Island City , Queens , NY , USA (Postal Code: 11102). This sports center provides 25 yards, 5 lanes, Indoors. For this Swimming Pool, only phone number is number here. Fitzgerald Gymnasium , 65-30 Kissena Blvd. , Flushing , Queens , NY , USA (Postal Code: 11367). Among all the activities offered by the center, if you are interested in swimming you will appreciate 25 yards x 42 feet, 6 lanes, Indoors. Just in case you would like to contact this Swimming Pool before dropping by, we only know the phone number. 89-25 Parsons Blvd. , Jamaica , Queens , NY , USA (Postal Code: 11432). This sports center delivers 20 yards x 20 feet, 4 lanes, Indoors. For this Swimming Pool, only phone number is number here. 32-23 Queens Blvd. , Long Island City , Queens , NY , USA (Postal Code: 11101). Among all the activities provided by the center, should you be interested in swimming you will get pleasure from 25 yards, 6 lanes, Indoors. If you must contact this Swimming Pool, email address and phone number are both number. 15 Borage Place , Forest Hills , Queens , NY , USA (Postal Code: 11375). This sports center offers 20 yards x 20 feet, Indoors. Contact knowledge for this Pool for example phone number and email address are number. Avery Avenue and 131 Street , Flushing , Queens , NY , USA (Postal Code: 11368). Among all of the activities offered by the center, if you are interested in swimming you will appreciate Olympic size x 25 meters, 8 lanes, Indoors. Just in case you wish to contact this Swimming Pool prior to dropping by, we only know the phone number. Are you a member of employees or know well this location? Please, contact us to validate this facts.